PERT and CPM are most commonly used methods for project management. In this article, I will discuss the differences between PERT and CPM. PERT or Programme Evaluation and Review Technique is an event oriented method of network planning. In it, the emphasis is focused on start and completion events rather than on activities. The activities taking place between events are not specified. 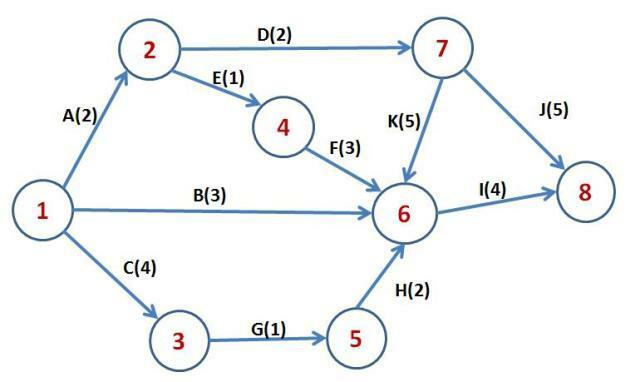 In PERT network, the events fall in logical sequence. But the logic of events may be different for different planners. Hence PERT network may vary from planner to planner depending upon their decision as which event to precede or occur concurrently. In PERT network the start circle is omitted and only the completed event is recorded. PERT helps in identifying critical area which threatens the completion of the work. It provides the means to determine how resources can be transferred from one job to another job. CPM is also network comprising events and activities. This network is activity based. The activities are represented by arrowed lines and events by circles. The activities are connected in logical sequence. The time allotted to each activity is related to cost. 1. PERT is event oriented whereas CPM is activity oriented. In simple words, in PERT network interest is focused upon start or completion of events and not on activities themselves. 2. In CPM network no allowance is made for uncertainties in the duration of time involved whereas in PERT network uncertainty is considered. 3. In PERT, time is not related to cost whereas in CPM the object is to develop an optimum time cost relationship. However, PERT has since been extended in this direction and the line dividing PERT/CPM is gradually fading out. 4. In CPM duration of activity is estimated with a fair degree of accuracy. In PERT duration of activities are not so accurate and definite. 5. In CPM both time and cost can be controlled during planning. Pert is basically a tool for planning. 6. PERT is used in research and development project, basically for non-repetitive type projects. CPM is widely used in construction projects. Also Read – Basic Things You Must Know For Preparing Bar bending Schedule.